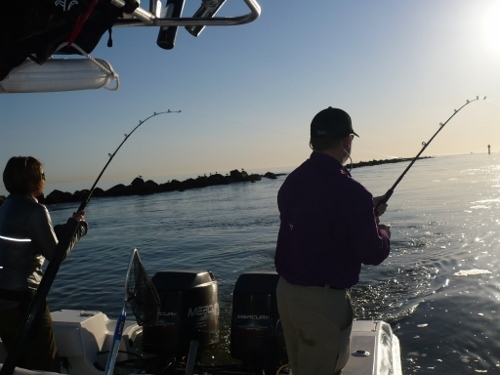 Great for year round fishing, Galveston Bay offers mild winters and temperate waters. 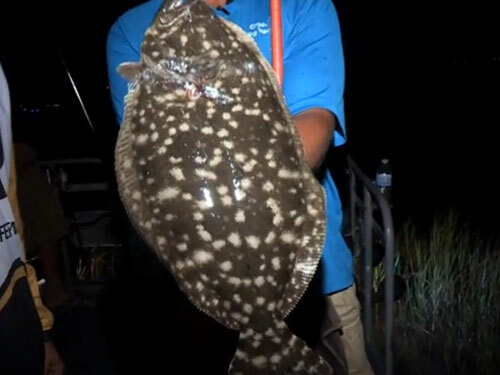 Flounder gigging is a Texas tradition that lets you experience the best of night time fishing and hunting. Enjoy the thrill of reeling in the big fish on one of our Galveston deep sea fishing charters. 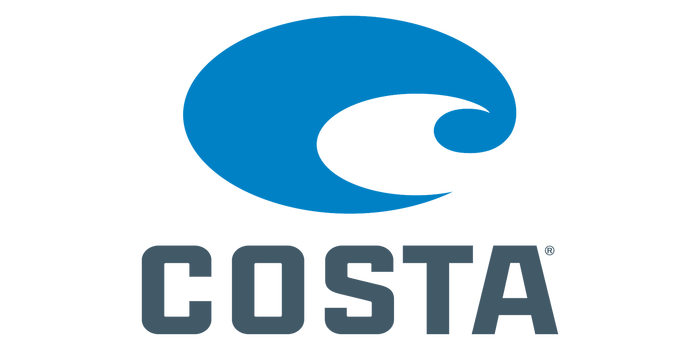 If you’re looking to “wow” corporate visitors or to get that party started, why not plan acustom fishing charter? 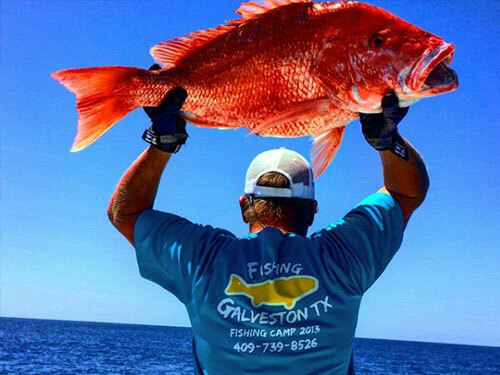 The Finest Fishing Charters in Galveston are offered by Fishing Galveston TX. Fishing Galveston TX offers the most amazing fishing charters in Galveston. Capt. Greg Verm won’t let you go home empty-handed. 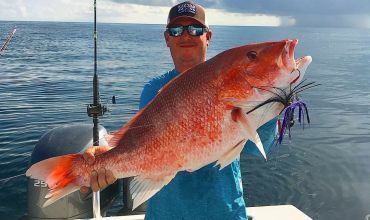 Whether you’re a seasoned angler or a first-time fisherman, your first Fishing Galveston TX charter will have you hooked. 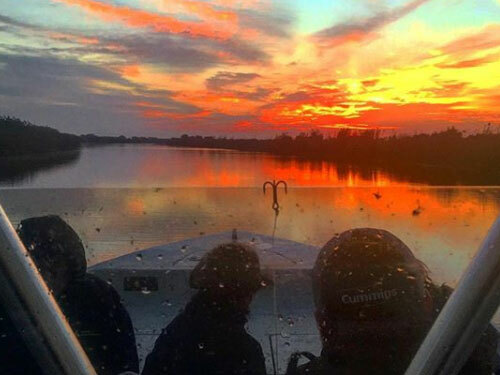 Each of our Galveston fishing charters affords you the opportunity to travel the open waters of Galveston Bay and enjoy the wide variety of aquatic life that exists there. 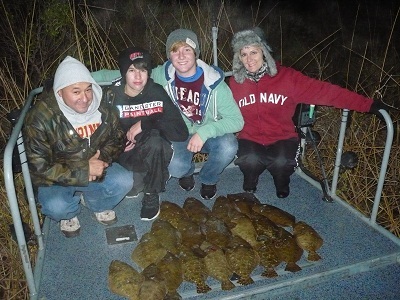 If you’re a seasoned angler, you should try our version of a long-time Texas tradition,flounder gigging. 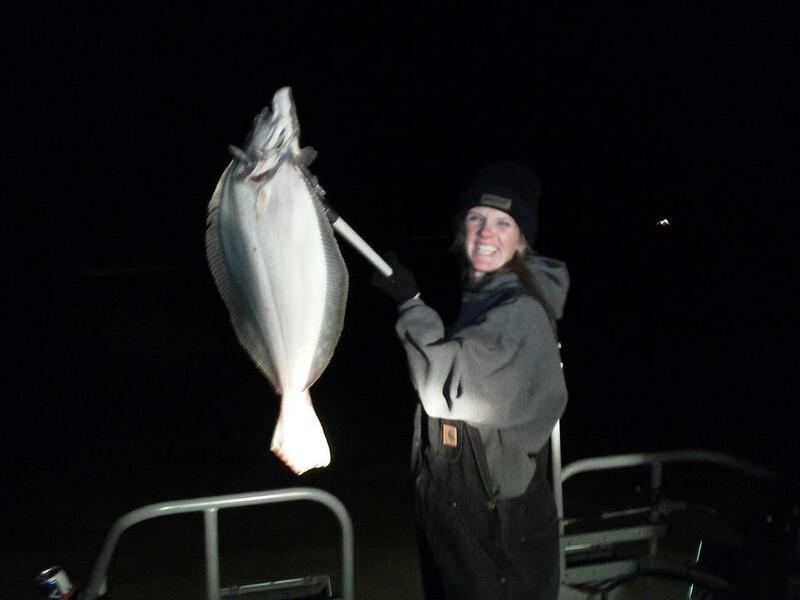 The thrill of this Galveston charter is your role as hunter/fisherman on the night waters. Need a little more time on the water, try pairing a daytime fishing charter with an after dark flounder gigging adventure. Not up for fishing today, that’s ok. We’ve do excursion trips thatwill satisfy your desire for a day on the water without the fish. We’ll even take you to your favorite waterfront restaurant for lunch. 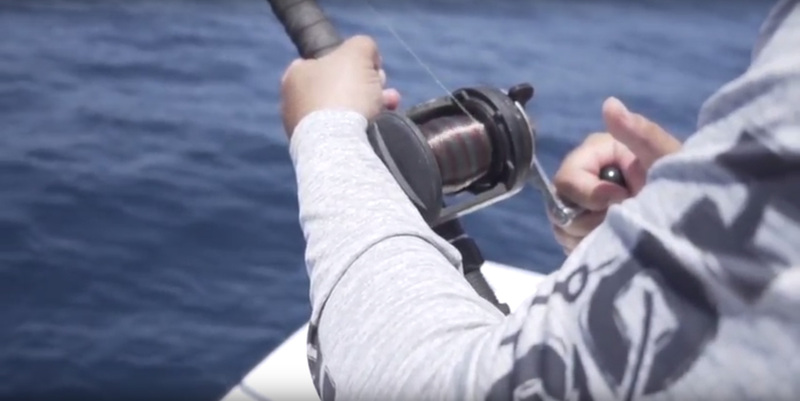 Looking for the perfect charter to get the kids hooked on fishing? 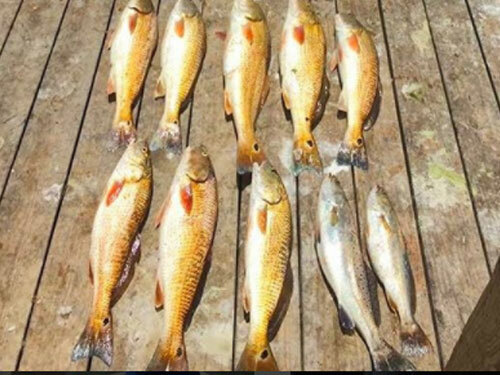 Try our bayou bay fishing charter. 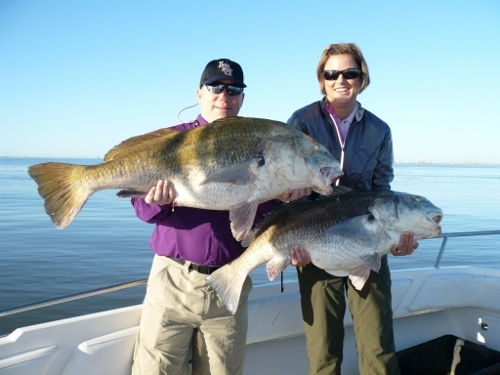 Your family will enjoy fishing Galveston TX for black bass and catfish on the calm waters of the bayou. With a little luck, the kids might even catch sight of an occasional alligator. We’ll then make our way out to the saltwater marsh and bays to fish for redfish, trout and flounder. Get your adrenaline rush as you fight the “Big Ones” on one of our Jetty fishing charters. 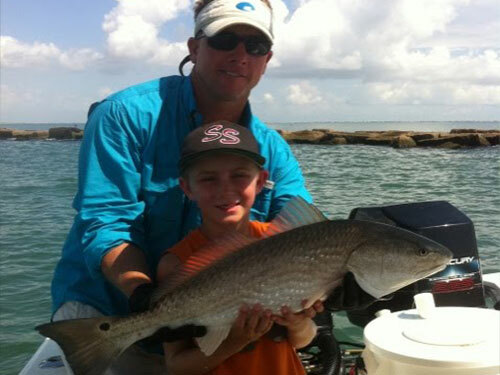 The Galveston jetties are known for their excellent year-round fishing. 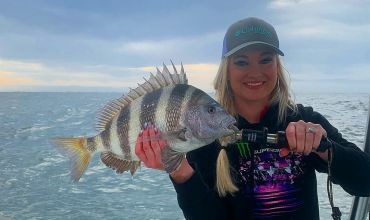 Enjoy the thrill of fishing for big speckled trout, bull reds, flounder, sheepshead, black drum, sharks, stingarees, and many other saltwater fish. Fishing Galveston TX offers highly productive deep sea fishing charters. 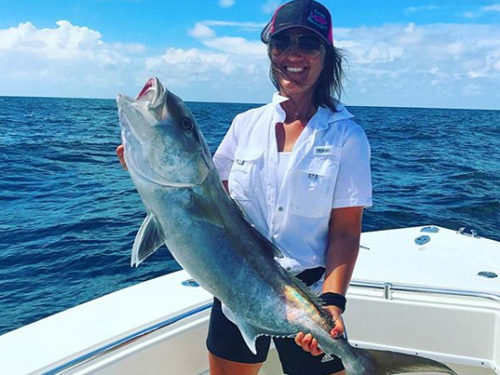 On our Galveston deep sea fishing charters anglers can target Mahi Mahi, Sharks, Red Snapper, King Mackerel, Amberjack, Wahoo, Sailfish, Grouper, and Tarpon. You’ll climb aboard our 30 foot Fountain equipped with Suzuki twin engines, GPS plotter, Depth Finder, Marine Weather Radio, Radar, EPIRB, Safety Equipment to US Coast Guard Standards. Our Galveston charter fishing boat also has a 30 gallon livewell with custom Oxygen Response System to keep our live bait LIVE and a porta-potty. We’ve even got an iPod hookup, so that you can enjoy your favorite tunes on your way out to our deep sea fishing spot. No matter what type of fishing or water adventure you fancy, Fishing Galveston TX has a fishing charter to match. You’ll experience love at first bite as you tour the beautiful waters of Galveston Bay. Once you’ve tried one of our charters, you’ll keep coming back for more, guaranteed. Contact us today to book your fishing charter in Galveston. Greg, We had an absolute blast giggin with you last Halloween! You made the trip exciting and worth every penny! Cannot wait to do it again! Greg, thank you for helping my son realize his dream of flounder giggin. My exchange student from Ecuador will forever remember his first fishing experience here in the states!!! Looking forward to our next trip. Captain Greg, We had such a great time fishing with you. Little Paul and Casey still talk about the BIG REDFISH they caught with you. I recommend you to everyone, especially if they want their kids to have a great time fishing. 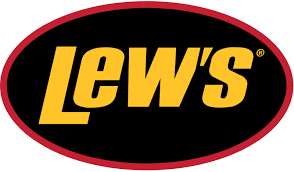 We will be back to see you this summer and will do a fishing and gigging combo. I think the kids are ready! Capt Greg…you are the greatest! We have had the best time fishing and never leave the water empty. Thanks for being so patient….can’t wait to get back on the water with you as our guide! We had such a great time catching Bull Reds with you, Captain Greg. We can not wait to come back. 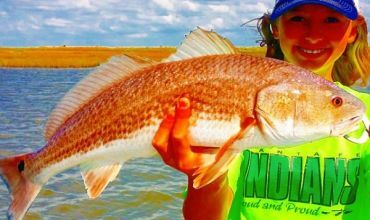 Marie’s arms were sore from all of the redfish she reeled in Saturday. We will be back. We had a great day fishing with Captain Greg! We had 2 big drum hooked in less than ten minutes. We had so much fun catching these giant fish! We also caught our limit of sheeps head which were also very fun to catch. We were so pleased with our trip and have already recommended Captain Greg to several people. If you are looking to have a great day on the water and actually catch fish you should use him. He also has great music! I hope we are able to return soon. We could not have had more fun!